I'm wondering if you have your shoe tied too tight? Our feet swell when running, do some fit is really important. I feel like my running shoes are almost too big - lots of room in he toe box because you slide forward a little at impact. (As it was explained to me) have you been for for shoes? Okay here is one. I was running tonight. After I finished my jog/walk intervals and started my cool down walk ( I am trying to walk/jog at least 3 miles, 6 days a week) my right foot/ankle felt numbish and that sleepy feeling. Should I be concerned and can anyone help explain what happened. Thanks. Thank you Dina for those wonderful answers and links. I hope this helps. @DJ, the more you train, the better it becomes especially concerning your heart rate. It will regulate itself soon. Thank you for the tips! I'll check out those websites for some help as well. Breathing deep into my stomach is the challenge as well as making it a steady rhythm, but I keep practicing even while walking or throughout the day. Last night I did some walking/jogging (or more like trotting in my case) intervals last night where I just focused on my breathing. What I noticed was that the more jogging & out of breath I was, the harder it was to breathe into my stomach. But I'll just keep practicing which is probably key. 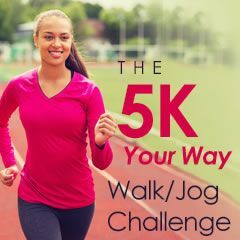 I'm on week 3 of this 5k training plan, and I have a couple of questions for those who are more experienced runners. 1. I have never been a runner. Even in my younger years I wasn't much for running, probably because I wasn't athletic. I'm having a hard time figuring out a good breathing rhythm for myself. I know the idea is take deep, steady breaths, but taking deep breaths has always been a challenge. So much so that my doctors get frustrated with me when they ask me to take a deep breath. This is my question: What method do you use? And how do I develop one that works for me? 2. I've noticed that every time I do a jogging interval, my heart rate goes up 30-40bpm. Is this normal to go up that much? It also goes above my max heart rate. Is that something I should be concerned with? Or will it adjust down the more I train & run? Thank you for any tips or suggestions!